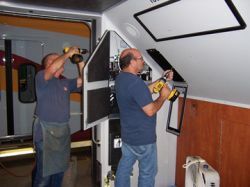 Employees at the Bombardier Transportation facility in Thunder Bay work on the interior of a commuter rail car. Thunder Bay's scenic perch on the western shore of Lake Superior gets plenty of those much coveted quality-of-life points. Recreation opportunities abound and the city's cultural offerings are diverse. "People come here with a pre-conceived notion that it's a remote area," says Ron Dysievick, general manager at Bombardier Transportation's Thunder Bay facility. "We have a heck of a time transferring them in, but we have a heck of a time transferring them out. It's a great place to live." The city's location gives it a valuable entrée into the United States' Midwestern market with a not-too-congested border crossing just 32 miles (51 km.) south. It also has the province's third-busiest airport and Canada's sixth largest port. Firms such as Bowater (with Canada's largest pulp and paper complex) and Bombardier dominate the city's industrial base. Bombardier is fulfilling several major contracts to supply commuter rail vehicles for U.S. and Canadian customers. In the eight years prior to 2004, the plant averaged building 130 cars per year. Production fell to 50 last year. But Dysievick is optimistic business will grow as the continent's population and gasoline prices both continue to rise, putting pressure on cities to opt for public transit systems. "There's reason to believe the transportation business will be better than it has been," Dysievick says. Thunder Bay is beginning to diversify with new-line businesses, too. One of the contact center industry's leading sources of information, contactcenterworld.com, moved there from London in 2001 in order to better serve its primary market, North America. The organization's business has more than tripled since then and it now serves 82,000 corporate members across the globe. Raj Wadhwani, founder and editor-in-chief of contactcenterworld.com, says Thunder Bay presents a good opportunity for call center operations, because the city has been home to a number of call centers and there's a good supply of trained employees. He also lauds the area's low costs and quality colleges. When Wadhwani began searching for a North American base, he first looked at Washington, D.C., among other locations. Then, at a contact center trade show in Toronto, he met a representative of Thunder Bay. After a 10-day tour of Ontario, Wadhwani decided Thunder Bay would be good place to live. Wadhwani isn't the only European entrepreneur to find a home in Thunder Bay. GRK Fasteners, a designer and distributor of high-quality construction screws, opened in 1990 and is now in the midst of its fifth expansion. The company, which contracts with precision manufacturers in Germany, Switzerland and Taiwan to make its screws, primarily serves the Midwestern U.S. construction market. GRK is owned and operated by Uli Walther and son, Mirco, who moved to Thunder Bay from Germany. Although separated by 412 miles (663 km. ), Thunder Bay and Sudbury will share Canada's first new medical school in more than a generation. The Northern Ontario School of Medicine (NOSM), with campuses at Lakehead University in Thunder Bay and Laurentian University in Sudbury, opened on Sept. 13. NOSM will focus on rural and remote medicine, and will help address the critical shortage of Northern Ontario physicians. Local and provincial officials think the med school will help spur biotech in the region and complement Lakehead University's Paleo-DNA Laboratory, a pioneer in the application of modern molecular genetic techniques to archaeological studies.